Cricket & Snail is a violin-accordion duo from the U.S. (Nashville,TN) that performs an eclectic mix of classical, early 20th-century popular and folk musical styles that transport their listeners to such exotic places as a French cafe, an opera scene, a Celtic dance or a Jewish wedding. 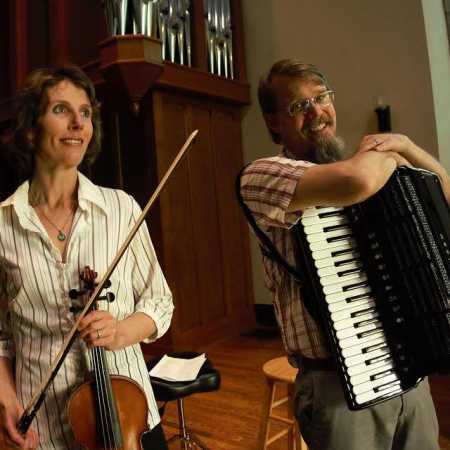 While violinist Lucie Carlson and accordionist James Carlson are both classically trained musicians and composers, they formed their duo because they wanted to make music that was freer from the boundaries of the concert hall. Whether playing on stage, in a cafe or on the streets of Prague, they always impress their listeners with the expressiveness of their playing, their original compositions and the surprising beauty of sound that their instruments make when combined.